Paper Liners Are the Best Option If You Line Your Green Cart--Try a Leaf & Yard Waste Bag. Line Your Kitchen Bin with Newspaper--Food Waste Slides Out Easily. Never miss a collection day or cancellation again! Sign up for waste collection notifications or service alerts with the new online Collection Calendar tool. Sort your garbage, organics and recyclables properly using the 'What Goes Where?' tool! April 24, 2019: Get together with your friends, community group or co-workers and gather litter from your road, beach or local playground. Call the Community Recycling Centre at (902) 543-2991 to register. You’ll receive bags, gloves and a certificate of recognition. Busy April 24th? No Problem! Groups are encouraged to participate before or after the date too. Friday, April 19: No waste collection in the Municipality of the District of Lunenburg or Town of Bridgewater. Saturday, April 20: Waste collection in the Municipality of the District of Lunenburg and Town of Bridgewater instead of April 19. Community Recycling Centre open 8:00 am - 2:00 pm. Monday, April 22: Regular waste collection in the Municipality of the District of Lunenburg and Town of Bridgewater. Community Recycling Centre open 8:00 am - 4:30 pm, office closed. Leaf & yard waste collected year-round, on your regular collection day. Maximum of three bags of leaves or bundles of branches collected when your green cart is curbside, four bags or bundles collected when your cart isn’t curbside. Leaves can also go in your green cart. On your regular collection day during this week. Entire Town collected on this day. The household hazardous waste depot at the Community Recycling Centre will re-open Monday, April 1. Residents can drop off unused paint, old propane tanks and many other hazardous wastes. Drop off unused flares, fireworks and ammunition at your local RCMP detachment. The Community Recycling Centre will be open Saturdays 8:00 am - 2:00 pm starting Saturday, April 6. These Saturday hours will remain in effect until November 30. For more information, call (902) 543-2991. CBC Halifax interview with the Outreach & Compliance Officer for the Municipal Joint Services Board. The Compliance Officer investigates illegal dumping reports in the Municipality of the District of Lunenburg, Town of Bridgewater and Town of Mahone Bay. Report illegal dumping by calling (902) 543-2991. Spring weight restrictions are now in effect on many Provincial roads. Look for signs which say your road has been restricted before putting your waste out for collection. Find out more about restricted roads, call Department of Transportation and Infrastructure Renewal at (902) 543-4121or visit their website. If your road is restricted, place your waste at the nearest unrestricted public road by 7:00 am on collection day. Call the waste hotline at 1-855-530-3324 for details about where to put your waste at the roadside. The Community Recycling Centre is celebrating Compost Awareness Week by giving away free compost to Lunenburg County Residents. Bring: shovels, gloves, elbow grease and tarps. Take home up to a half cubic yard of compost: Supply and fill your own containers — totes, bags. Bring your trailer — it will be loaded for you. Trailer loads of compost must be tarped. Compost Awareness Week is May 5 - 11. 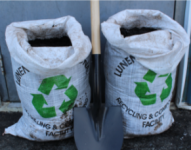 Read about how the Recycling centre's compost can be used. Questions, call (902) 543-2991. Residents of the Municipality of the District of Lunenburg can drop off two bags of garbage free at the Community Recycling Centre. Read more. As of January 2018, Mahone Bay residents are permitted to place one bulky item curbside for collection on the regular garbage collection week (Green Week). For more information, please call Town Hall at (902) 624-8327. Read the Bulky Waste Collection Notice and the 2018 Solid Waste Collection Schedule. This does not apply to residents in the Town of Bridgewater or the Muncipality of the District of Lunenburg.